What Kinds of Cat Have Long Hair & Ear Tufts? 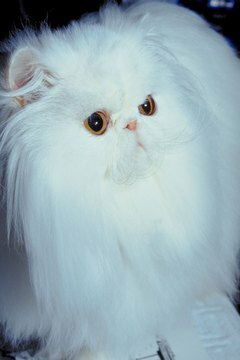 This Persian has ear furnishings, but not ear tufts. What could be more cuddly in a kitty than a plush, long coat combined with ears topped by fine tufts of hair? If your fluffy feline has both features, she might be a particular breed—or she might be a perfect mix who got lucky on the draw. Ear Tufts or Ear Furnishings? In the cat world, “ear furnishings” is the term for fur that grows from the inside of the ears, while “ear tufts” refers to fur that grows specifically from the tips of the ears. Ear tufts are sometimes called “lynx tipping,” because of the resemblance to the fur on the tips of the ears of lynx. This native American breed’s long hair serves as protection through the harsh winters of his namesake state. Friendly, loving and laid-back, this rather large cat is very people-oriented. His heavy coat is smooth and water-resistant and comes in all colors, and his ears are well tufted and well furnished. Just a weekly grooming will keep him looking great. Siberian and Norwegian forest cats are also well suited to the cold climates in which they evolved. Both breeds have long double coats and so don’t shed much. Instead, they molt once or twice a year. The “Wegie” has lots of ear fur—it grows not only from the tips but also from the insides of the ears, curving out and around, sometimes growing to 3 inches or longer. The standards for these two breeds say that tufts are desirable but not required, although most individuals sport them. Both have friendly and outgoing personalities. The Siberian is a bit of a clown while the Wegie prefers the role of nurturing all the other creatures in the household. Some breeds come in both short- and long-haired versions, including the Manx. Formerly known as the Cymric, the long-haired version of the playful Manx is easily recognized by his lack of a tail. The longhaired Manx’s coat is silky and plush in texture, with the abdomen and neck ruff longer. He has lots of fur in, around and atop his ears. The muscular, athletic American bobtail is noted for his wild look, which belies an affectionate and sociable personality. Lynx-like tufts on the ears are the norm. The longhaired version has a slightly shaggy double coat with a little bit of a ruff and muttonchops. The LaPerm’s coat can be a variety of lengths and textures, from short to long, from wavy to tightly curled. The longhaired version of this gentle yet active breed is usually full, curly and soft. Longer haired LaPerms also sport lots of fur in the ears and full ear tufts. What Does an Adult Maltese Dog Look Like Full Grown? Why Does My Cat Have Fur on the Bottom of Her Paws? What Are the Causes of Bobbed-Tail Kittens?